Welcome to our fourth and final discussion of Born a Crime by Trevor Noah. I hope you all enjoyed reading this book this month! I know I did. Be sure to come back Monday for our March readalong of The Underground Railroad by Colson Whitehead. But before that happens, let's wrap up Born a Crime! Did you like the book? What were some of your favorite passages or chapters? In Part III, the book's chapters get longer, and darker, as Noah goes from being a teenager to a young man. What struck you most about these chapters? Would you call the book a coming of age story? ...crime succeeds because crime does the one thing the government doesn't do: crime cares. Crime is grassroots. Crime looks for the young kids who need support and a lifting hand. Crime offers internship programs and summer jobs and opportunities for advancement. Crime gets involved in the community. Crime doesn't discriminate. In "My Mother's Life," Noah says children have to learn how to love their parents unconditionally and that it's not automatic or instinctive. Do you agree with this statement? Do you watch The Daily Show? If you do, has reading the book changed how you see Noah in any way? Are you left with any unanswered questions you're wondering about? Anything else that caught your attention or you want to discuss? Welcome to our third discussion for our Born a Crime readalong. This week we'll be discussing Part II. To check out our previous discussions, please see our week 1 and week 2 discussion posts. This past week was Valentine's Day, and appropriately Part II features not one, not two, but three stories from Noah's tragic misadventures in romance. Which one of these was your favorite? Which the saddest? Did they remind you of any of your own teenage heartbreaks? Juicy details pls! In Chapter 9, "The Mulberry Tree," Noah says that's it's easier to be an outsider trying to fit in than an insider who doesn't. Do you think this is true? How do you think that experience shaped how Noah related to the world going forward? How did you react to the actions of Abel? Trevor Noah: entrepreneur or hustler? One of the most tragi-comic stories in the section, I think, is Chapter 13, "Colorblind." What were some of your reactions to the story? Noah never tells us what happens to his friend–why do you think that is? Anything else you found interesting or want to discuss? Thanks for participating in the readalong so far! If you posted about this section on your blog or anywhere else on the internets, be sure to link back to it here so we don't miss it. Otherwise, feel free to discuss the book in the comments section. Next week Tuesday, the last day of February, we'll be closing our readalong with a discussion of Part III. See you then! 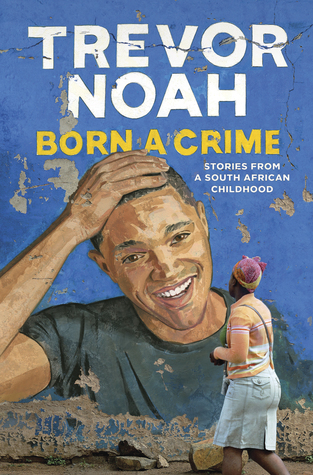 Welcome to our second discussion of Born a Crime by Trevor Noah. Today we'll be finishing up Part I of the book. To check out our first week's discussion, go here. What do you think were the themes in Part I of the book? How were the essays tied together? Asking for a friend. In Chapter 4, Noah talks about the power of language and how it can overcome–or at the very least confuse–racism. He says if people speak the same language, they recognize one another as members of the same "tribe," even if they look completely different. "Maybe I didn't look like you, but if I spoke like you, I was you." Do you think this is true? What would you do if you came home and found out your kid had burned down someone's house? In Chapter 7, Noah talks about his dog Fufi and how she basically formed his entire philosophy regarding relationships. What do you think of this philosophy, and does this simile really work after you start thinking about it? Which chapter made you cry more, the one where Noah meets his father as an adult or the first chapter? Anything else that surprised you or you want to discuss? Thanks for joining our discussion! If you posted about Born a Crime on your blog, please link back to it here so we don't miss it. Or feel free to post your responses in the comments. Don't miss our next discussion on Monday, February 20th, where we'll cover all of Part II. See you then!